I heard from my friend, the talented singer-songwriter Maggie, that she would be back in Hamilton to visit family and friends. It was exciting to catch up and hear all about what she has been up to. 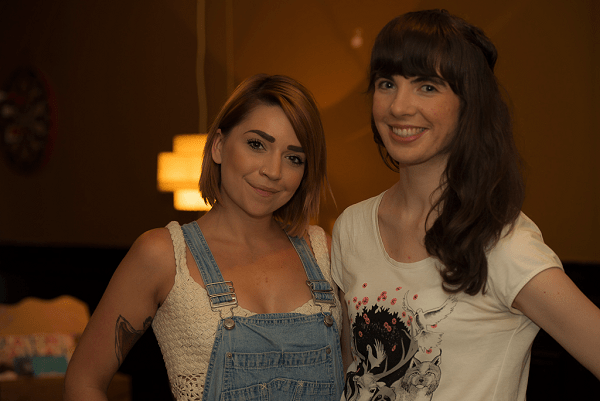 Maggie recently moved to L.A. where she has been working away on her music, writing new material and playing shows. Get caught up on her awesome videos she has been posting on her YouTube channel. Maggie was looking for a hip vintage shop to have a photo shoot with photographer Jorge Polio. I knew to look no further than Newold’s! I first featured Newold’s on the blog when they opened in April. It has been fun popping in and checking out their newest finds. 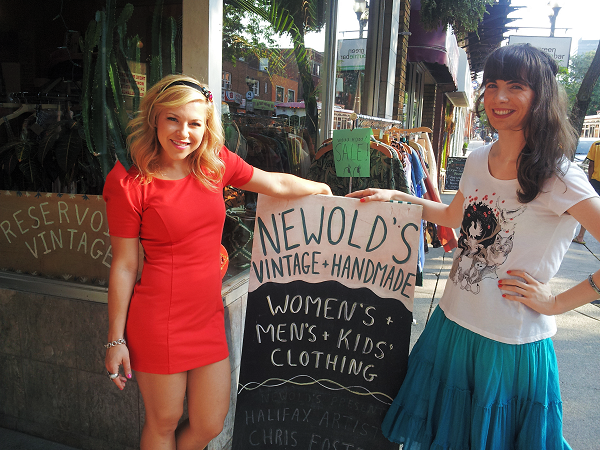 In August, Newold’s officially expanded into a collective, with three different vintage buyers stocking the store. My friend Danielle Plester just started selling her collection Lost & Found Vintage. Everything in Newold’s is so super cute and affordably priced. I was drawn to so many of Danielle’s pieces. Danielle was rocking some denim overalls, which I’m pumped to see back in style, along with rompers/jumpers. It’s a 90’s revival, and I’m into it. With Danielle Plester of Lost & Found Vintage. Photo by Jorge Polio. As Maggie and Jorge got to work on their shoot, I browsed the racks and so many items caught my eye. Maggie brought a few outfits and had a few wardrobe changes throughout the shoot. All of her outfits suited Newold’s, and she even had fun with a few accessories found in the shop. A bicycle propped up at the back of the store lent some inspiration for the shoot. Jorge got a few shots of Maggie walking the bike down the street while she rocked a lovely white dress that I thought was very Marilyn Monroe. Follow along with Maggie’s Hollywood adventures @allaboutmaggie. She’s doing us proud out there!